I follow a lot of teachers on Goodreads so I come across picture books all the time that I want to add to my to-read list. 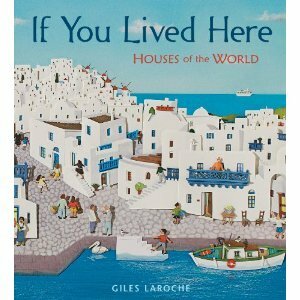 When I saw the cover for If You Lived Here I immediately went to my library's website to put it on hold. The cover rendering reminded me so much of the Greek island of Mykonos (and I was close - it's of Astipalaia, another Greek island) that it brought back vivid memories of my time in Greece. With elaborate, meticulously detailed bas-relief paper collages, If You Lived Here is a fascinating look at different types of dwellings from around the world and each turn of the page is like opening up a box with a beautiful jewel inside. While the text is helpful for better understanding the type and location of the dwellings, it's really the illustrations that are the stars here. I could see this book being extremely useful in any social studies class that discusses different types of dwellings. It is apparent from the cover alone that each illustration was lovingly created and inspired from Larchoe's own travels. Now that I've seen this stunning book and how it helped to relive some of my own travel memories and seriously sent me into a a painful bout of wanderlust, if it had been up to me, this book would be sporting a Caldecott sticker on it right about now. My husband and I have been tossing back and forth where we will go for our 10th anniversary trip next year. I want to go to Russia but he wants to go back to Santorini since it's a place we both loved so much. With one single illustration, this book has managed to make me lean on the side of going back to the Greek islands. I don't blame you for being influenced by that gorgeous illustration! It definitely makes one feel like going there. I really want to see what else it has inside. What a beautiful way for children to discover the way other people live! That book looks gorgeous! I love the idea of this book and I agree that it would be fantastic to incorporate into the classroom! Hope you have a wonderful time wherever you decide to go!